Janome 3128 is a sewing machine capable of doing pretty basic stuffs. It is priced high for the features on board. Janome 3128 is a 3/4 size beginners sewing machine. It is a pretty basic model. Feature wise, I can’t say that this is the best sewing machine you can get. But in terms of quality and performance, this machine is right up there. Being a 3/4 machine it is very lightweight and portable. It weighs just 12 pounds. A carrying handle is also provided, which is really cool if you are thinking for taking your machine to sewing class. It comes with 8 built-in stitches including a 4-step buttonhole. There are stretch and utility stitches for some basic sewing works. A dial is provided for the selection of stitches. Janome 3128 has a lever for reverse stitching as well. Tension can be adjusted using a dial. A work light is also provided for working in low light conditions. You can do free arm sewing by removing the storage compartment. This machine can sew at a speed of 650 stitches/minute, which is pretty decent considering the price. It also comes with a dust cover. 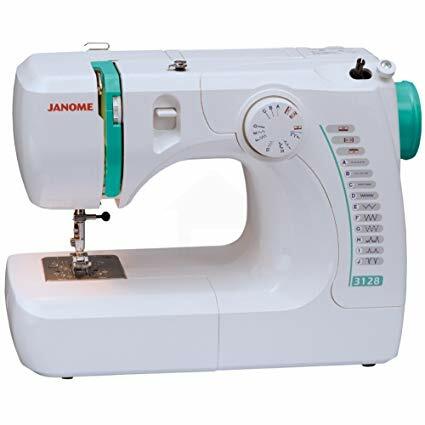 Janome 3128 comes with a 4-step buttonhole instead of 1-step, beginners will find it slightly difficult as they have to turn the dial multiple times to select the 4 different stages of buttonhole construction. If your primary purpose is to do buttonholes, please discard this machine. Janome 3128 is a reasonable machine for pretty basic stuffs. But is it really worth the price? Feature wise, it is not that great. Especially when you can get feature rich sewing machines from other brands at a lower price. I am not saying that this is a bad machine. It does what it is supposed to do. I am saying that it is slightly priced high for the features. One better alternative I can suggest is Brother XL2600I. It is few dollars cheaper and has far better features than Janome 3128. It comes with 25 built-in stitches, 1-step auto size buttonhole and so on. Moreover, Brother XL2600I ranks second in the list of ‘Top 10 Sewing Machines Available In U.S Under $200‘ list published by Sewing Machine Reviews.